Polypipe PVCu Cable TV Duct is specialist cable protection system designed specifically for the telecommunications industry and underground cable television communications protection. PVCu Cable TV Duct is available in two inner diameter sizes of 49mm and 90mm and supplied in lengths of 6 metres. 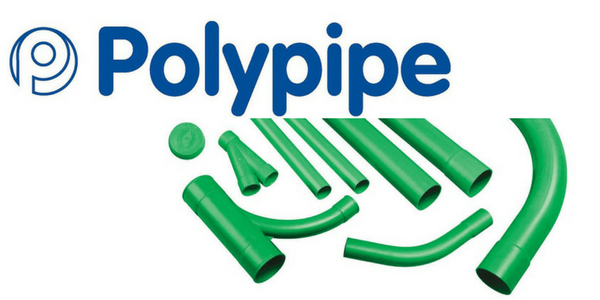 Polypipe’s PVCu cable duct have integral sockets and a short 54mm branch on swept tees is available for easy installation in congested footways. Polypipe’s PVCu cable TV duct is tried and tested by the telecommunications industry and adheres to the strict dimensions and performance requirements. Telecommunications cable duct is green as standard to allow quick identification of the cable type within the duct – telecoms cable lubricant is available to ease the pulling of cable into duct without incurring damage and allowing smooth low friction cable pull. T&D distribute a diverse range of Cable Pulling & Laying equipment for telecommunications applications. T&D stock an extensive range of Telecommunications products including feeder pillars, cut outs, isolators and conduit rods. Green cable duct meets the requirements of BS EN 50086 (Specification For Conduit Systems For Cable Management).